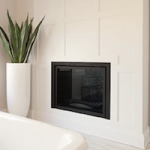 The biggest advantage of all these wainscoting systems is that they do not require panels. For applied moulding wainscoting or “show boxes” you can either purchase one of our conveniently available baseboards or even reuse your own baseboards. Regardless, of which cost effective system that offers any design of your liking, the walls have to be in good condition. If you are thinking of wainscoting for your next remodel, you should also consider how you plan to cover the stair cases within your home as well. The beauty of any of these systems is that the stiles be be cut to suit any staircase angle right on site. Secondly, we offer flexible components and rails so that you can also cover curved stair cases just as well and even more conveniently than ever. Applied Mouldings are very common and do not necessarily require a professional carpenter to install them. Whether you stick with a traditional application, or a larger boxed design, this system offers you the ability to keep your baseboards and will compliment the rest of homes design completely. The Recessed Panel System is an Elite Trimworks exclusive, what we consider to be the best value on the net. It goes together very easily and comes pre-routed for easy installation. Although it is inexpensive, it looks great in any situation and can adapt to any interior design choice. It installs right over the existing wall board using the existing wall as the middle panel. The Recessed Panel Wainscoting Kit is our most popular system, we have shipped thousands of kits since 2003. The Shaker Panel System is also available with pre-cut rails and stiles, but seeing as how Shaker stiles do not need to be routed, this system is very easy to customize and be applied to any wall of your project. This kit offers an unbelievably contemporary applicable while giving you the choice to add design and a more unique touch through our baseboard line up additions, we already give you the spacer included to do! In addition to these options, you may add or apply additional panel mould or trim. We offer both rigid and flexible panel mouldings for curved stair ways. Contact us with your preferences and project specifications and our experts will be more than happy to help you decide on what wainscot system is best for you.